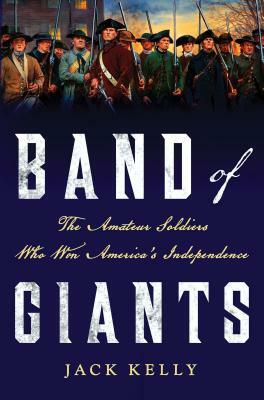 Band of Giants brings to life the founders who fought for our independence in the Revolutionary War. Jefferson, Adams, and Franklin are known to all; men like Morgan, Greene, and Wayne are less familiar. Yet the dreams of the politicians and theorists only became real because fighting men were willing to take on the grim, risky, brutal work of war. We know Fort Knox, but what about Henry Knox, the burly Boston bookseller who took over the American artillery at the age of 25? Eighteen counties in the United States commemorate Richard Montgomery, but do we know that this revered martyr launched a full-scale invasion of Canada? The soldiers of the American Revolution were a diverse lot: merchants and mechanics, farmers and fishermen, paragons and drunkards. Most were ardent amateurs. Even George Washington, assigned to take over the army around Boston in 1775, consulted books on military tactics. Here, Jack Kelly vividly captures the fraught condition of the war--the bitterly divided populace, the lack of supplies, the repeated setbacks on the battlefield, and the appalling physical hardships. That these inexperienced warriors could take on and defeat the superpower of the day was one of the remarkable feats in world history. Jack Kelly is a journalist, novelist, and historian. He has contributed to American Heritage, American Legacy, Invention & Technology, among other national periodicals, is a New York Foundation for the Arts fellow in Nonfiction Literature, as well as author of Gunpowder: Alchemy, Bombards, and Pyrotechnics: The History of the Explosive That Changed the World. He has appeared on The History Channel, been interviewed on National Public Radio, and conducted book signings across the country. He lives near Kingston in New York's Hudson Valley, where much of the action of the Revolutionary War took place.